Note: PrestaShop will work with PHP 5.1 or later, but the versions lower than 5.2 have bugs which might prevent some functions from working as expected (like invalid date timezone). 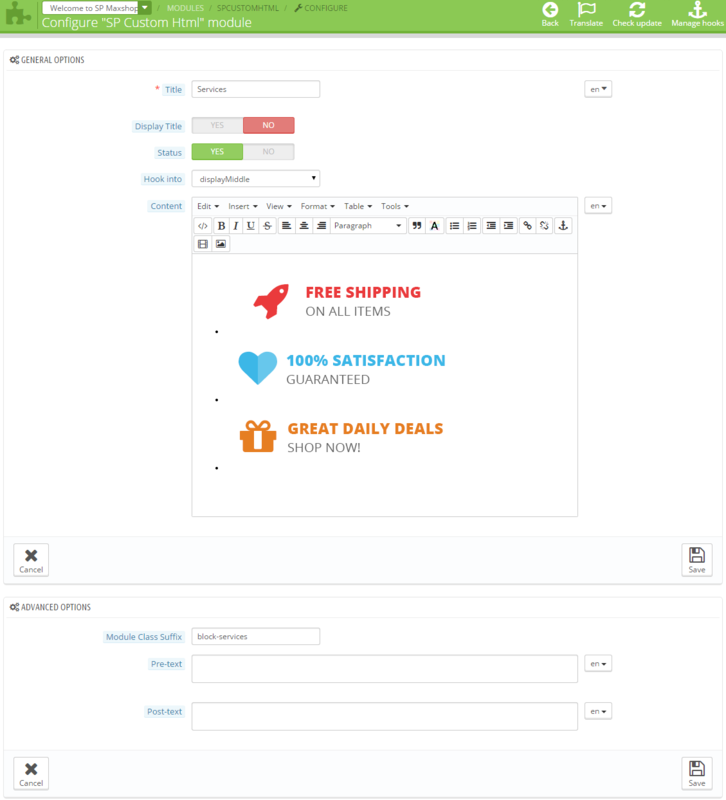 Please make sure your version of PrestaShop engine matches the template requirements (SP Zana Theme is Compatible with Prestashop version 1.6.x). 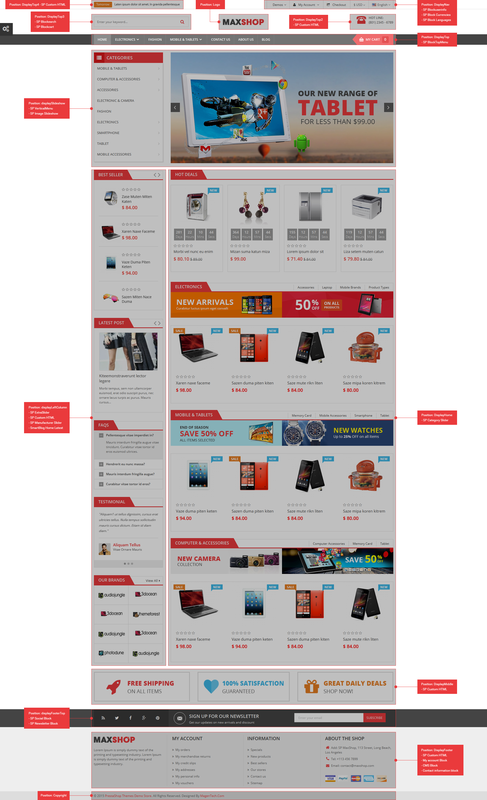 All versions of PrestaShop are available at SourceForge. 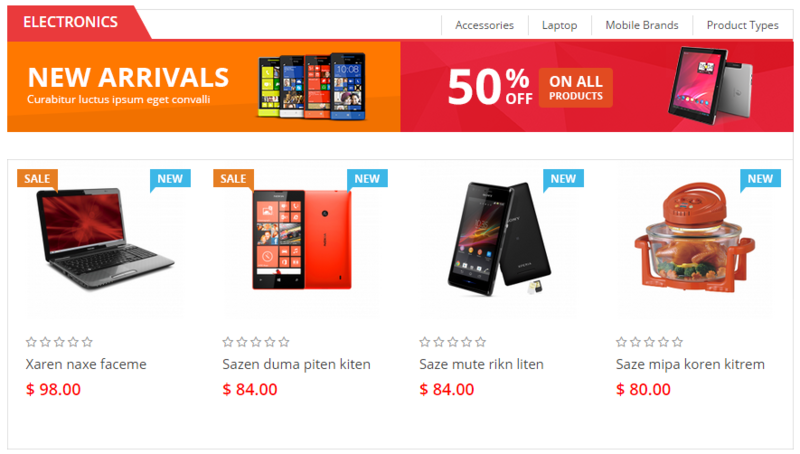 Manual Installation : Include of themeinstallator Package and Theme Installation Package. 2. In the Multistore Tree, click “Welcome to SP Zana“. 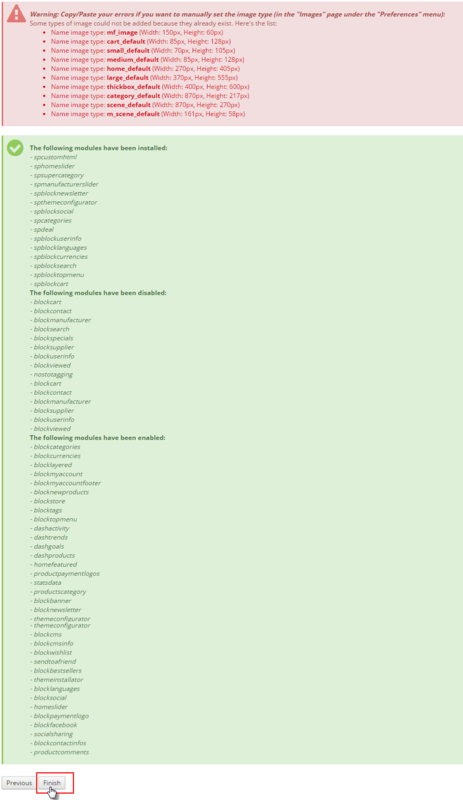 Note: Set the URL for the SP Zana Fashion Layout3 the same with layout2. Step 1: Install “themeinstallator” Module. Note: To install theme, you must extract the theme package and get “template.zip” file in the template folder that you have extracted to install. Please see image below. 1. 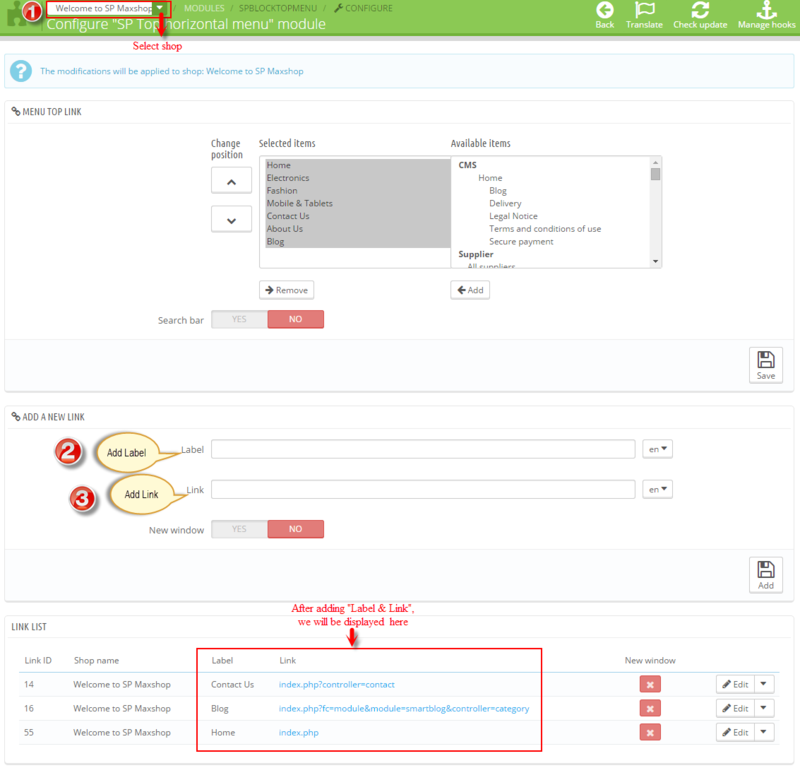 Find to the module that you have installed and clicked on Configure button to configure the module. 2. Navigate to “Import from your computer” >> choose the zip file in theme folder as named “sp_zana_layout1_theme_p16_v1.0.0.zip” >> Next. Step 3: Finally, you will see a notice message: ai?? ?The thumbnails were successfully regenerated.ai??? 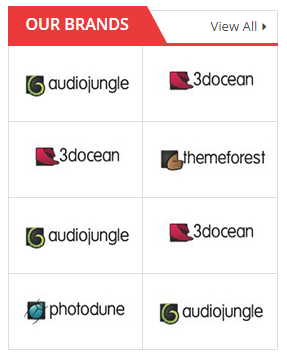 Please copy “override” ,”module” & “img” folder in the theme folder into the root directory. Note: If you want to install the Layout2 or Layout3 Theme, please install the same with Layout1 Theme. In order to change your store title, open the PrestaShop admin panel and go to Preferences > Store Contacts, the Contact details section. In the Shop name field, type in your store name and click the Save button to save your changes. 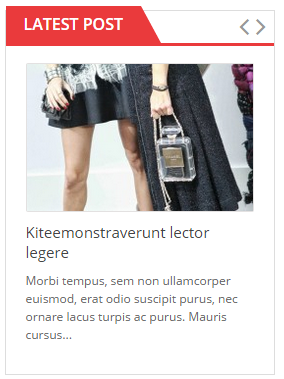 To edit slider images, find the Image slider for your homepage module on the Modules page of your PrestaShop store. It is located in the Front Office Features modules section. Click the Configure button to edit the module. 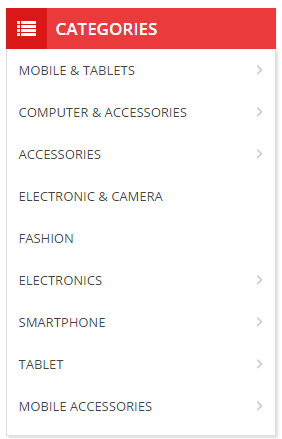 Navigate to the Catalog >> Categories menu. To create a new category, click the Add New button. Name: give your category a name. You can also put category titles for different languages in this field if youai??i? 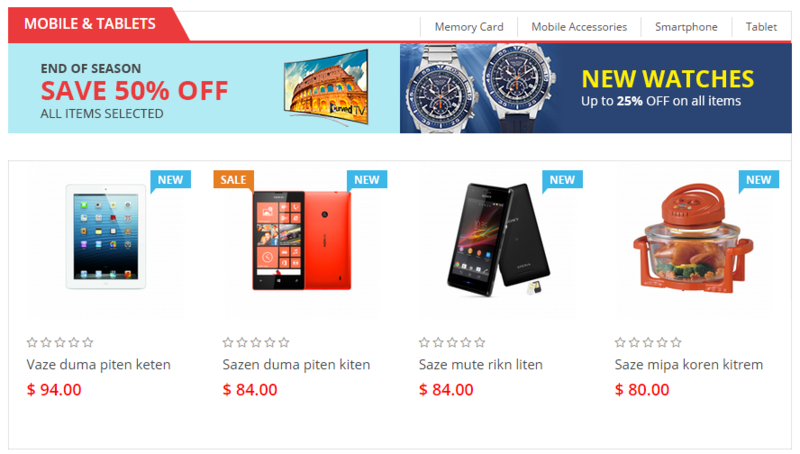 ?re using a multi-language store. Displayed: choose to enable or disable your category. Parent Category: if you wish to create a subcategory for a category other than the home page, choose the category under which it will appear. 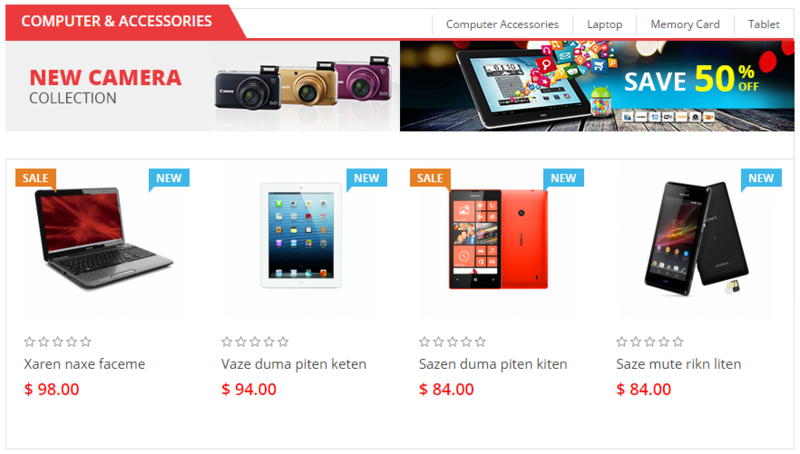 Description: add the content you need to the new category. You can use the visual editor to format your text, insert images, and turn on the source HTML code of the description. Image : click the Add file button to upload an image from your computer. 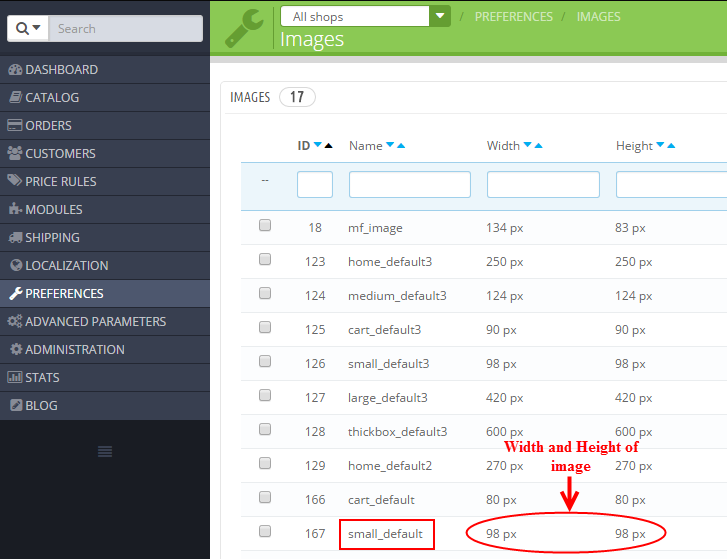 Thumbnails : you can add three thumbnail images that will be shown in the menu drop down on your front end. Meta title: the title that will appear on the search engines when a request is made by a customer. Meta description: your category description that will appear in search engine results. Meta Keywords: keywords to make your store recognizable by search engines. You can enter several of them, separated by commas, as well as expressions which must be indicated in quotation marks. Friendly URL : enables you to rewrite the addresses of your categories as you wish. Group access : the option to restrict access to the category and its products for certain customer groups. Navigate to Modules -> Modules and look for SP Top horizontal menu. 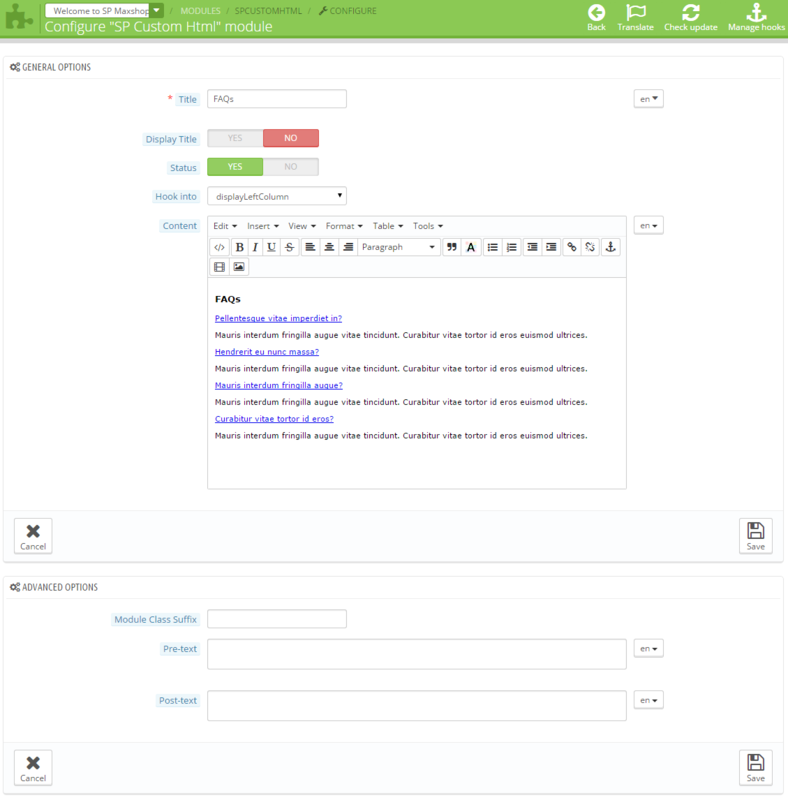 The left column displays current menu elements and the right one displays available menu elements. 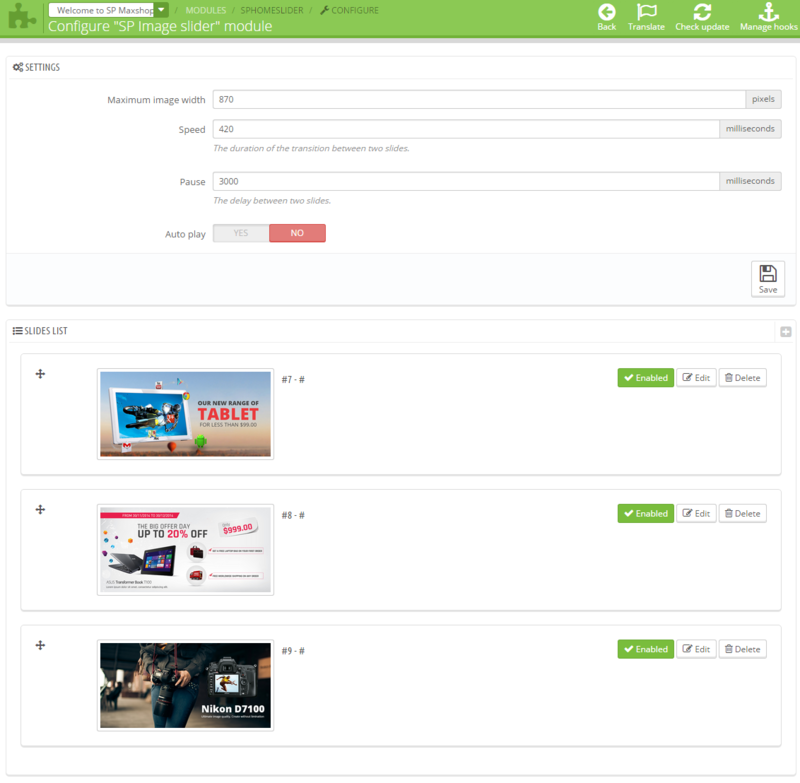 You will see the list of all your categories, CMS pages, manufacturers and suppliers as well as the option to add the link to the product page. You may also add custom links to the menu list using the Add a new link section. To add a new element to the frontend menu, you should select the required element on the right and click the Add button. Please check your web-store front-end. We added a new category and linked it to the top menu successfully. Step 1: In the Prestashop Admin Panel, navigate to Modules >> Modules >> look for “SP Custom HTML” module >> click “Configure” button to configure. Step 3: The configuration of “Welcome” Module as the illustration. 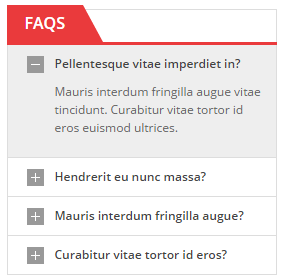 In the Prestashop Admin Panel, navigate to Modules >> Modules >> look for “user info block” module >> click arrow down in the right corner, it will display a list box that you can configure such as “Disable on mobiles, Disable on tablets, Disable on computers, Reset, Uninstall, Mark as favorite, Delete”. Disable on mobiles: This will disable the front-office view of the module only for mobile devices (smartphones, etc.). 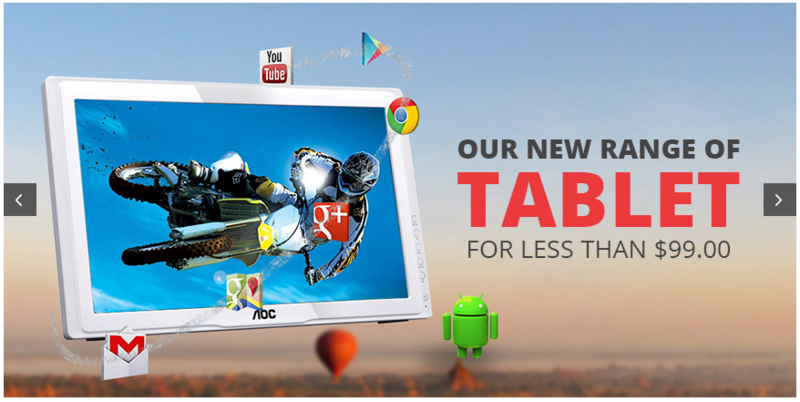 Disable on tablets: This will disable the front-office view of the module only for tables. Disable on computers: This will disable the front-office view of the module only for desktop computers. Reset: This will restore the module’s settings to their defaults. Delete: This will remove the module from the modules list, and delete its files and folders from your server. Note: “SP Language block“; “SP Currency block“; “SP Quick Search block“; “My Account block” configure the same with “SP User info block” as above. Step 3: The configuration of “Home Phone” Module as the illustration. 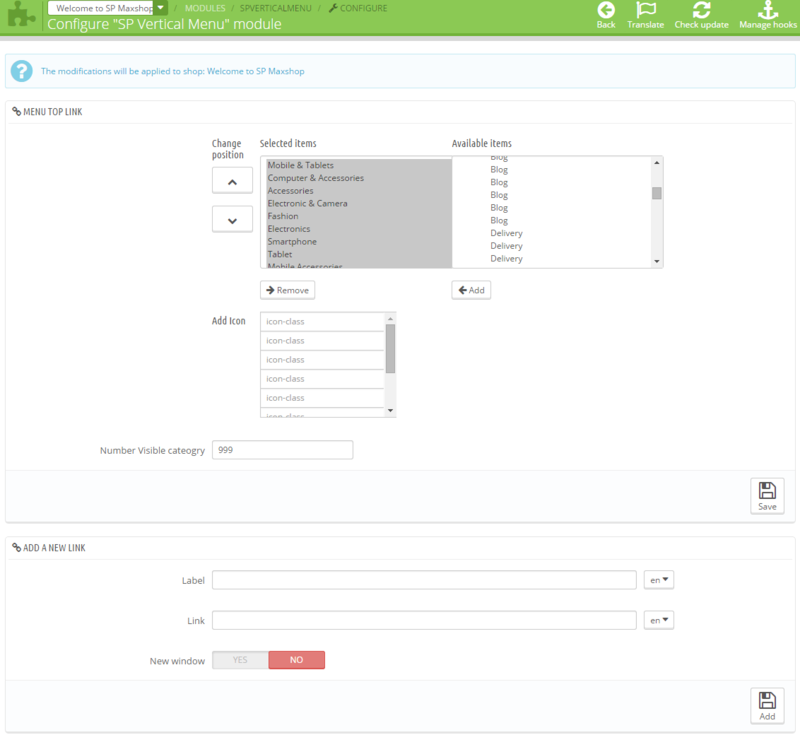 Step 1: In the Prestashop Admin Panel, navigate to Modules >> Modules >> look for “SP Vertical Menu” module >> click “Configure” button to configure. 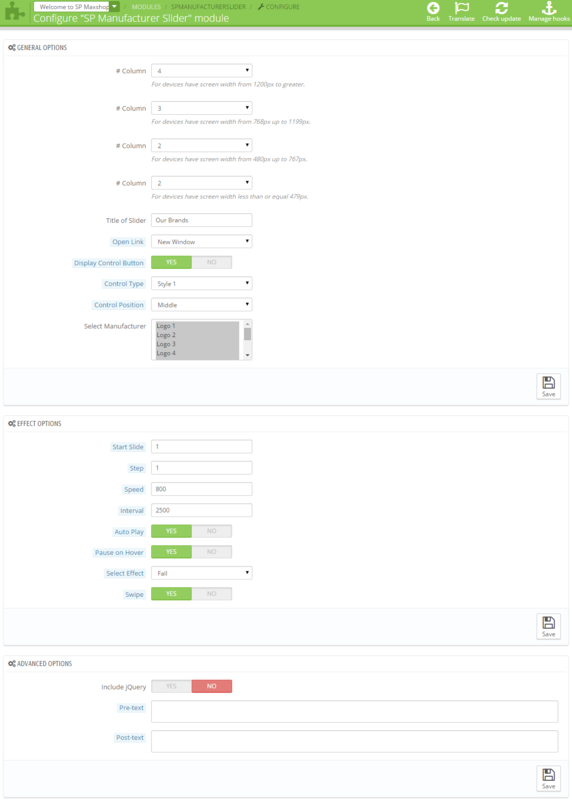 Step 1: In the Prestashop Admin Panel, navigate to Modules >> Modules >> look for “SmartBlog Home Latest” module >> click “Configure” button to configure. 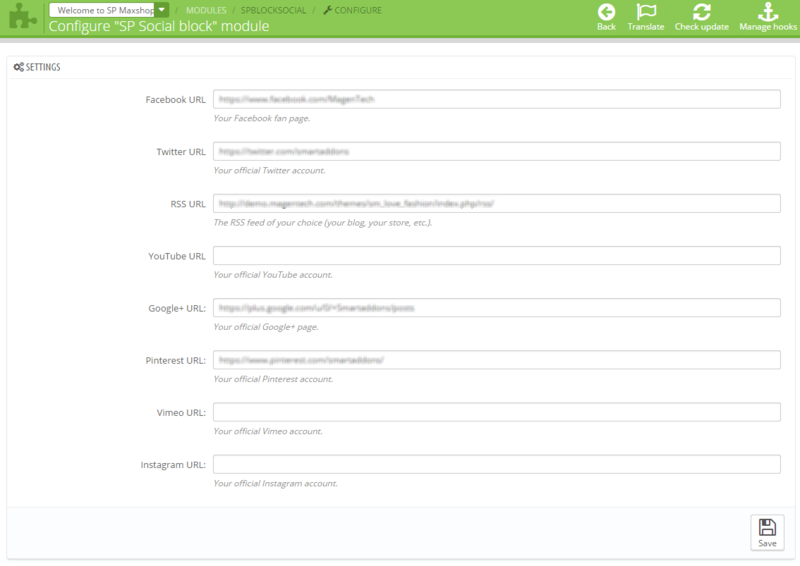 Step 1: In the Prestashop Admin Panel, navigate to Modules >> Modules >> look for “SP Social block” module >> click “Configure” button to configure. 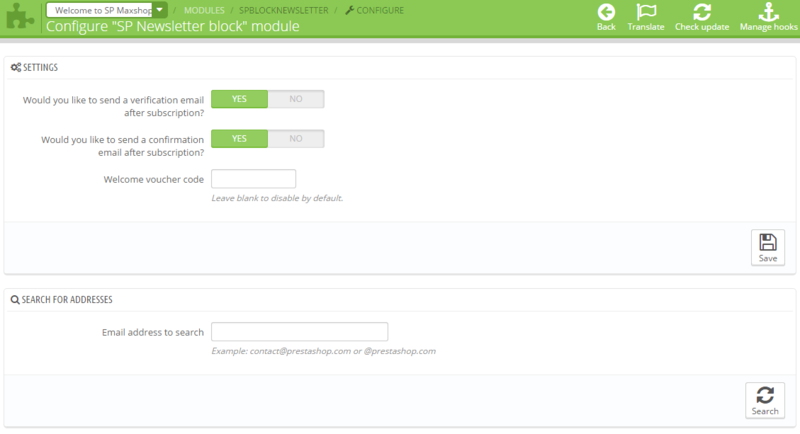 Step 1: In the Prestashop Admin Panel, navigate to Modules >> Modules >> look for “SP Newsletter block” module >> click “Configure” button to configure. 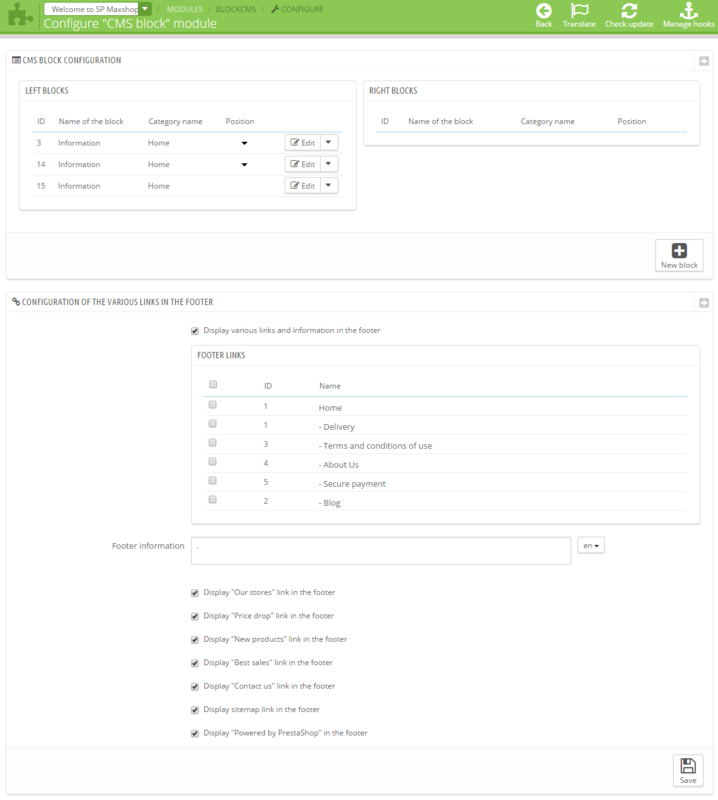 Step 1: In the Prestashop Admin Panel, navigate to Modules >> Modules >> look for “CMS block” module >> click “Configure” button to configure. 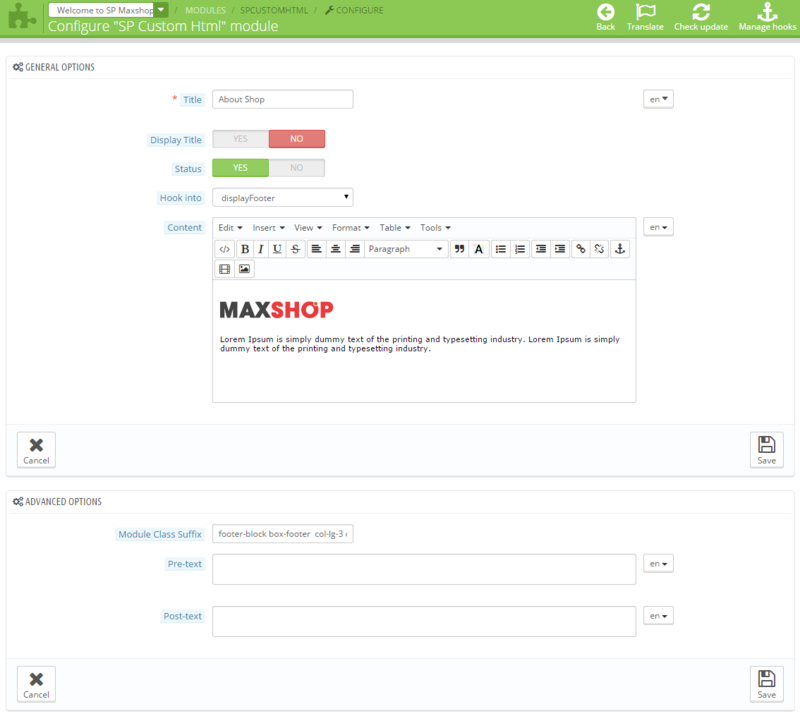 Step 1: In the Prestashop Admin Panel, navigate to Modules >> Modules >> look for “Contact information block” module >> click “Configure” button to configure.